of the basic investments supported under CDD (and other community-based operations) is a logical concern that has been raised by both practitioners and critics (OED 2005). driven and -based development projects to better understand the factors contributing to their success. The intended beneficiaries of this assessment are client governments implementing CDD and community-based projects for similar types of rural infrastructure, task teams, and other potential users. In addition to highlighting factors of success, this paper shares relevant materials, procedures, and guidelines to help support O&M systems. The review found four critical factors for O&M success, and these areas serve as the analytical framework for this paper. Organizational and institutional arrangements: Comprising the organizational structure and roles and responsibilities for operating and maintaining the infrastructure at the community and local administration levels. Capacity building: High-quality, timely training. Financing: Revenue collection and cost-sharing mechanisms, and willingness and ability to pay. Technical considerations: Design and technology choices, and complexity. Conservation-Based Agricultural Development-Led Industrialization (ADLI, 1994), supported by Mass Mobilization Campaigns (1991) and Youth Responsive Land Policy (2008). Hamburg/ Bonn/Ordos – 22 August 2017 – More people, less erosion – Ethiopia’s Tigray region demonstrates that this can be a reality: Ethiopia’s Tigray region will take home the Gold Future Policy Award 2017, beating 26 other nominated policies to the prize. Also known as “Oscar for Best Policies,” the Future Policy Award highlights the world’s best policies that combat desertification and land degradation this year. With unique collective action, voluntary labour and the involvement of youth, the people of Tigray are restoring land on a massive scale. As a result, erosion has decreased significantly, groundwater levels are recharged, and the uptake of sustainable agricultural practices made a significant contribution to food self-sufficiency and economic growth. Ethiopia, Tigray Region: Conservation-Based Agricultural Development-Led Industrialization (ADLI, 1994), supported by Mass Mobilization Campaigns (1991) and the Youth Responsive Land Policy (2008). The Tigray region’s interpretation of Ethiopia’s development strategy focuses on food self-sufficiency and economic growth by conserving land and promoting sustainable agriculture. Thanks to a unique combination of collective action, voluntary labour and the involvement of youth, the people of Tigray are restoring land on a massive scale. The “Guidelines for development agents on soil conservation in Ethiopia” has been in use for 30 years; its translation into the Amharic language was published in 1987 and the book was reprinted in 1995. Thousands of copies were handed on to development agents, technicians and experts, some of whom sent comments and proposed more technologies based on their field experience. Since 2003, another reprinting was enthusiastically demanded by the regions, which organised region-wide campaigns in soil and water conservation that are still ongoing. At the federal level, the Ministry of Agriculture prepared a number of guidelines and policies for sustainable land management, to which this book is now added. in most farming systems; they are also economically viable from a 30-year. 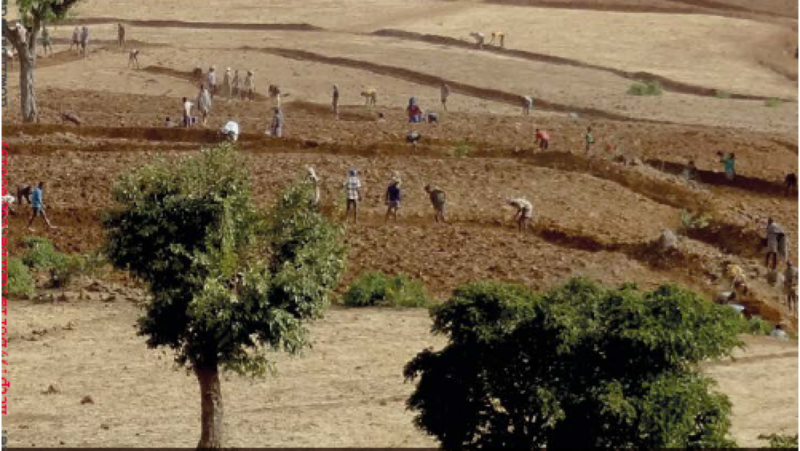 perspective, as a detailed study on the economics of land degradation in the Ethiopian Highlands has shown (Kaspar Hurni et al. 2015). Despite all the successes observed, however, only about 18% of the rainfed croplands have so far been treated with soil and water conservation measures. If we consider that 77% of the rainfed croplands have slopes steeper than 8%, there is a need to further apply measures on nearly 60% of all croplands, i.e. nearly 12 million hectares still have to be treated. It is for these activities that this book is being reprinted, enhanced by complementary information based on more recent experiences. Please Use the Leave a Reply box below pages for any comment or feedback. Over the past decade, Ethiopia has made tremendous economic progress to become one of the fastest growing countries in the world. Between 2005 and 2015, the country’s GDP more than quadrupled from 12.4 billion USD to 55.6 billion USD, compared to the more moderate increase of 63% from 7.6 billion USD to 12.4 billion USD in the previous ten years (1995 to 2005). This growth was fueled by widespread institutional and policy reforms carried out by the Government of Ethiopia (GoE) across all major sectors (education, health, water, transport and telecommunications), but particularly in agriculture, which forms the backbone of the national economy. These reforms have gone a long way toward reducing the number of Ethiopians living in poverty: in 1995 nearly 79% of the population was living in poverty, a figure that has been slashed by more than half to 34% 20 years later. This remarkable progress notwithstanding, Ethiopia’s agriculture sector remains paradoxically underdeveloped. As the largest component of the economy, agriculture employs a majority of the Ethiopian population. The majority of these are smallholder farmers practicing subsistence farming on less than one hectare of land. Furthermore, the country is not exploiting effectively its vast natural resources, as less than half of all arable land is currently under cultivation (15% versus 36% of total land area). Additionally, a majority of the agricultural activity is environmentally unsustainable and relies on annual rainfall despite the availability of abundant water sources. Nonetheless, considerable and continued investments by the Government have succeeded in helping farmers increase their crop production and productivity, adopt yield-enhancing inputs, and leverage community organizations like cooperatives to aggregate produce so that farmers can benefit from economies of scale. Recent economic gains have also made Ethiopia an attractive destination for foreign direct investment. Coupled with the wide range of crops (over 100) that can be cultivated across the country’s varied agro-ecological zones and climates, there are plenty of reasons to be optimistic about future agricultural developments. The GoE’s primary development target is to reach middle income country status by 2025, an aspiration that requires serious attention to be paid to the existing systemic bottlenecks hindering further agricultural growth. In addition, agriculture must serve as the basis for industrialization in order to reap maximum rewards from the country’s comparative advantages in producing raw materials. For example, coffee, sesame and vegetables – the country’s top agricultural exports – account for a combined 1.4 billion USD in annual earnings, but could fetch far more after agro-processing for value addition than they do as raw materials. Capitalizing on these agro-processing opportunities, however, requires addressing challenges along the entire value chain, including: limited transportation and processing infrastructure; insufficient aggregation and storage capacity; outdated farming techniques yielding lower quality outputs; low input use; and high vulnerability to climate change and extreme weather events, such as the 2015 El Niño phenomenon. In light of these circumstances, the Government has set out clear objectives to transform the agriculture sector, and the economy as a whole, in successive Growth and Transformation Plans (GTPs). This manual provides basic information about Ethiopia’s highland bamboo species, and thereby aims to increase public awareness about this important natural resource. Practical guidelines for cultivating and managing highland bamboo are offered herein to help growers establish new plantations and manage existing bamboo stands. The highland bamboo species is botanically known as Yushania alpina. This species grows naturally in ecological zones of the country between 2200 – 3500 meters above sea level. The coverage of this species in Ethiopia was roughly estimated in 1997 to be about 130,000 hectares. Over the last 10 years, the resource base has been significantly reduced because large areas of indigenous bamboo forests have been cleared for conversion to agriculture. This is the case in the highland areas of the country within a 200 km perimeter of Addis Ababa. Alpine bamboo has traditionally been used as a material for making fences and water pipes, as well as a variety of handicrafts. The culms are used by cottage industries for woven and plaited products such as basketry, mats, and other decorative items. In recent years, Y. alpina has been used for manufacturing industrial products such as parquet flooring, window blinds, and curtains. The plant is also useful for bio-energy. This manual provides basic information about Ethiopia’s lowland bamboo species, and thereby aims to increase public awareness about this important natural resource. Practical guidelines for cultivating and managing lowland bamboo species are offered herein to help growers establish new plantations and manage existing bamboo forests. The lowland bamboo species is botanically known as Oxytenanthera abyssinica. It is a clump forming, solid stemmed bamboo that is widely distributed in the dry regions in the western part of Ethiopia. Since ancient times, this woody plant has been a vital resource for communities living in the semi-arid regions of the country. It has traditionally been used as a raw material for building and it has also been used for making numerous household utensils, basketry, and handicrafts. It is also a plant with nutritional value: young bamboo shoots can be cooked and eaten as a vegetable, and the foliage can be used as animal fodder. Bamboo is a fast growing woody plant, and as such, it is a renewable source of fuel which has a heating value comparable to that of timber from trees. In Ethiopia, lowland bamboo naturally occurs and thrives in areas where living conditions are extremely harsh. The bamboo forests in the western side of Ethiopia are breeding grounds for malaria mosquitoes and tsetse flies. The grave risk posed to human populations, livestock, and domestic animals has compelled farming communities to settle at a distance from bamboo resources. Despite the risks involved, dependence on the bamboo raw material drives local people to go into the forests to extract culms for their domestic requirements. During the last century, forests were mainly assessed in terms of the commercial value of timber. Rarely were other forest components considered to be of major economic importance. In the 1900s, when vast areas of tropical forests were denuded of timber for local use and exportation, bamboos and other non-wood products were usually discarded or destroyed during logging operations. In the 21st century, however, there is a growing consensus that non-wood forest products are not only crucial to ecosystems but also invaluable to the livelihood of communities. Non-wood forest products are known to generate substantial foreign exchange and are increasingly being regarded as valuable commodities around the world. Our perception and evaluation of non-wood forest products is changing due to alarming rates of deforestation and decreased timber yields. The government of Kenya has, for instance, formulated policies to address the state of low supply of wood products. A ban on logging was declared in most of the forests in the country and awareness campaigns on the importance of forests and forest conservation were undertaken by non-governmental organizations. In Kenya, policy makers have also focused on the importance of non-wood products and services and their economic potential as alternative sources of revenue. Similar initiatives have been made by other East African Governments. Among the most important minor forest products, bamboo has continued to gain recognition. Once upon a time, bamboo was regarded as a weed; today it is considered as a multipurpose plant and as a valuable timber substitute. It is much sought after for use in horticultural fl ower farming, handicraft, residential fencing and other minor cottage industry products like toothpicks, basket making and match sticks. Bamboo raw materials are however scarce due to the current ban on bamboo extraction from public forests. Even if the ban were to be lifted, the cover of bamboo resource is presently low due to excisions of indigenous forests where bamboo was dominant. This calls for production of raw materials from farms not only to ensure expanded supply, but also to get the materials nearer to the market yards where handicraft industries are fl ourishing. Increased availability of materials would also provide for the fast expanding horticultural fl ower farming. Most of the bamboo resources in Kenya comprise one indigenous species, Yushania alpina, which was formerly known as Arundinaria alpina. This species, which is commonly known as “alpine bamboo”, occurs naturally on the main mountains and highland ranges of Kenya and eastern Africa. The species is estimated to cover between 145,000 – 150,000 ha, located mainly at altitudes ranging from 2400 m to about 3400 m above sea level. In Ethiopia the species is estimated to cover 120,000 – 130,000 ha. With the exception of a few clumps of the species left on farms by farmers living around forest areas in the highlands, where the species grow naturally, little cultivation of this species has been done in both countries. Such farmers are keen to undertake planting themselves, but face problems with establishment and the lack of effective management interventions. In addition to Yushania alpina, Ethiopia has a huge resource base of what is commonly called lowland bamboo or Oxytenanthera abyssinica. The species occurs at elevations of 300 – 700 meters and with rainfall of 300 – 800 mm/year (Treville and Kigomo, 1992). This species is estimated to cover between 750,000 – 900,000 ha in Ethiopia (LUSO- Consult, 1997). There have been no formal attempts of managing or domesticating this species (Kigomo, 1997). Sudan, Tanzania, and Uganda also have this species but at a much lower area cover. Oxytenanthera abyssinica is also distributed in isolated pockets between 12-13 degrees latitude, from Ethiopia to Senegal in the north, and Mozambique across to Angola in the south. During the last twenty years, some research on species selection and investigations on their growth was done mainly by the Kenya Forestry Research Institute (KEFRI) in collaboration with several Asian research and development institutions. This research work has introduced over twenty Asian bamboo species into the country. Half of these are successfully growing in the field under various ecological conditions. Appendix 1 lists some bamboo species successfully introduced in Kenya. The introduced species are more versatile and can be cultivated in areas where the local bamboo does not thrive. Background information about the origin and habitat of some of these species is provided in Appendix 2. These species can be cultivated in parts of Africa with similar growing conditions. Farmers, horticultural flower farming companies, and the Forest Department have expressed great interest in growing these bamboo species on their land, but no harmonized methods have been introduced to ensure that projected outputs are successfully achieved. The situation of bamboo in Kenya is paradigmatic for much of tropical Africa. Governments, NGOs, and private enterprises in many African countries are developing initiatives to promote the cultivation of bamboo as an industrial crop. Whilst these guidelines on bamboo plantation management have been developed in response to a specific need in Kenya, it is thought that they will be useful in other parts of the continent. Food-insecure households in many countries depend on international aid to alleviate acute shocks and chronic shortages. Some food security programmes (including Ethiopia’s Productive Safety Net Program–PSNP – which provides a case study for this article) have integrated aid in exchange for labour on public works to reduce long-term dependence by investing in the productive capacity and resilience of communities. Using this approach, Ethiopia has embarked upon an ambitious national programme of land restoration and sustainable land management. Although the intent was to reduce poverty, here we show that an unintended co-benefit is the climate-change mitigation from reduced greenhouse gas (GHG) emissions and increased landscape carbon stocks. The article first shows that the total reduction in net GHG emissions from PSNP’s land management at the national scale is estimated at 3.4 million Mg CO2e y-1 – approximately 1.5% of the emissions reductions in Ethiopia’s Nationally Determined Contribution for the Paris Agreement. The article then explores some of the opportunities and constraints to scaling up of this impact. Food security programmes (FSPs) can contribute to climate change mitigation by creating a vehicle for investment in land and ecosystem restoration. Maximizing mitigation, while enhancing but not compromising food security, requires that climate projections, and mitigation and adaptation responses should be mainstreamed into planning and implementation of FSPs at all levels. Institutional barriers to optimal implementation should be addressed, such as incentive mechanisms that reward effort rather than results, and lack of centralized monitoring and evaluation of impacts on the physical environment. Project implementation can often be improved by adopting best management practices, such as using productive living livestock barriers where possible, and increasing the integration of agroforestry and non-timber forest products into landscape regeneration. This ArcGis training manual is prepared to assist a training to regional staffs on the practical application of GIS software in work place. The training will help staffs in managing and updating MIS or mapped data base systems that will be established in the near future. To propose thematic areas and suggest contributory professional(s) required to update the guideline, as well as to agree with the identified resource persons to undertake updates of specific thematic areas of the guideline based on their area of expertise, experience and interest. Officially request organizations to assign nominated and person(s) to engage in the process of the guideline update. Prepare a ToR for the update processes. Presentation and discussions on the identified thematic areas for the update of the Guidelines. The meeting will be facilitated by the director of the NRMD together with the existing CBPWD Guideline key editor(s). The Proposed Thematic Areas (with the list of Infotech technologies & Main Categories) and the number and mix of professionals suggested will be discussed, and contributor(s) will be identified and assigned for each thematic area. Finally, a small group of persons will be nominated to prepare a ToR for the update process. The meeting will be held with professionals identified from development partners and invited key professionals as a resource persons to engage in the update of the Guidelines. The proposed persons are from the following organizations: GIZ-SLM, ILIR, IWMI, WFP, FAO, USAID, WB, AAU, WLRC, MoANRs, and private sectors. Approximately 30 (22 invited resource persons, plus 7 from the NRMD) participants are expected to attend the mini meeting. The meeting will be held on Wednesday, Feb. 21, 2018, from 09:00 – 11:00 AM in the Natural Resource Sector meeting hall of the MoANRs (Bld B, Floor 6). This study analyses the impact of intensity of tillage on wheat productivity and risk exposure using panel household-plot level data from Ethiopia. The results suggest that smallholder farmers use tillage as an ex-ante risk management strategy. The main policy implication of this study is that the opportunity cost of switching to reduced tillage in wheat production seem rather high unless farmers are supported by appropriate incentive schemes. NATURAL RESOURCE MANAGEMENT Blog at WordPress.com.